Frijoles Peruanos are Peruvian Beans. They are also known as Canary Beans and are actually a product of Mexico. 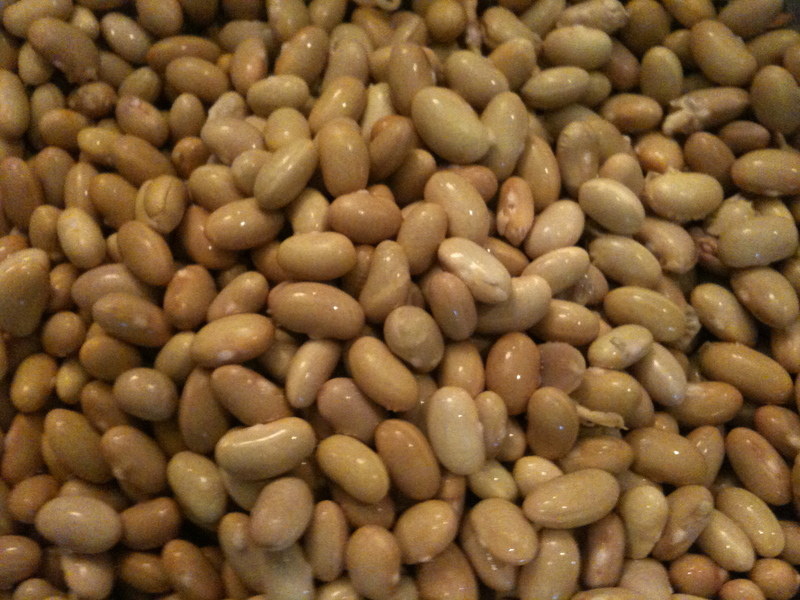 They are lighter in color and a little creamier than Pintos. I have been to a couple Mexican restaurants lately that serve Peruvian beans instead of Pintos and they have become a new favorite of mine. I decided to track them down at the market (it wasn’t too hard…they sell them at my local chain grocery store in the Latin foods department) and make them at home. They are lighter in color and a little creamier than Pintos. I love all beans, especially when they are made from scratch. They are so easy to make if you have a little patience and taste so much better than canned. I like the to soak them ahead of time to speed up the cooking. Make sure you pick through them to remove any rocks or debris first. When cooking beans, you don’t want to salt them until they are done cooking as the salt can make their skins tough. After soaking the beans during the day, they cooked up in about 90 minutes. I re-fried them in a little bacon fat…just enough to give them that good re-fried bean taste, not so much that your cholesterol will shoot up. If you are anti-bacon (which would be just plain crazy), you can just re-fry them in a little olive oil. 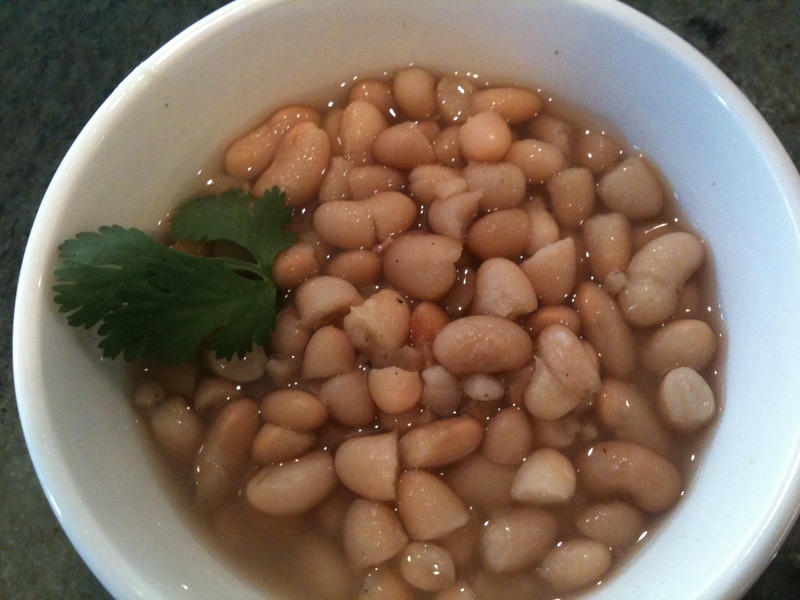 These re-fried beans would be really good in a bean and cheese burrito! 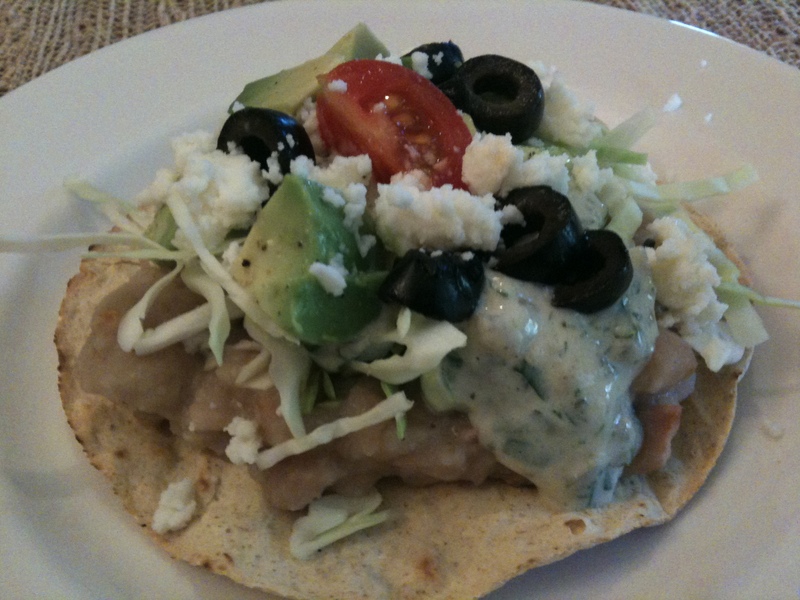 After layering the tostada shells with some of the re-fried beans, I topped them with some queso fresco, a little shredded cabbage, a creamy salsa verde (the same one I use on my fish tacos), and some diced avocado. All family members approved and had seconds! The left over re-fried beans even made an appearance in Max’s lunch the next day with some tortilla chips and salsa. I found these great baked tostada shells from Costco. 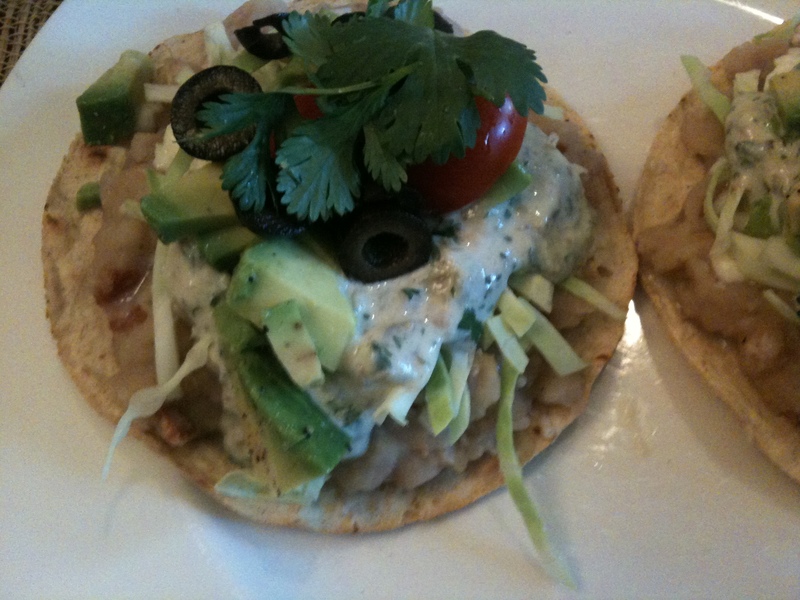 They tasted great and held up to all of my tostada toppings. Rinse and drain the beans after soaking. Put in a large pot and cover with an inch or 2 of water. Add the garlic cloves and bay leaves and bring to a boil. Reduce the heat, cover and simmer for about 1 to 1 1/2 hours, stiring every so often and checking the level of the water. If the water drops below the beans, add a little more. After the beans are tender, season with salt and pepper and turn off the heat. In a separate pan, fry the bacon until it is crisp then remove it from the pan and drain on a plate with paper towels. Discard all but about a tablespoon of the bacon fat and return the pan to medium heat. Using a slotted spoon, add the beans to the pan. Once all of the beans are in the pan, add about 1/2 cup of the liquid from the beans. Using a potato masher, mash the beans so to a partially creamy consistency. You want to leave some whole for texture, but have some smashed to make it nice and creamy. Add more of the bean liquid if necessary. You don’t want your beans to runny, or they won’t stay on your tostada shell. Crumble up your reserved bacon and stir into the re-fried beans. First put a layer of the beans, then top with some cheese. Add the cabbage and creamy salsa verde next. Top with the optional garnishes. These are a bit messy, but delicious! Rohnda, is Hansi 500lbs? This looks amazing! I made these beans the other night and we all LOVED them! Thanks for the recipe! Hi Carrie! Thanks for trying them! So glad you all liked them. It’s so nice when the whole family likes dinner!